If you have an above-ground fuel storage tank, below-ground fuel storage, or generator belly tank, Valley Oil Company can inspect the integrity of your fuel and the inner contents of your diesel or gas tanks free of charge. Valley Oil Company provides professional fuel analysis and polishing services and is the leader in tank and fuel testing and polishing. If your fuel contains contaminants – such as water, bacteria, sludge, sediment, rust, or algae – fuel polishing transforms your contaminated fuel, or old uncontaminated fuel beyond its shelf life, back to a usable product. 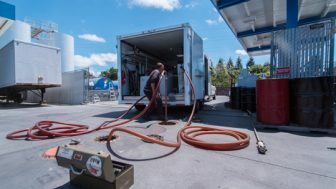 Valley Oil Company remains the only tank cleaning provider on the West Coast to operate state-of-the-art equipment fitted with optic scopes, which enable clear visibility and thorough cleansing of all areas within your underground and above-ground storage tanks, including lower spaces where contaminants collect. No other tank cleaning company has optic scopes or the ability to see deep inside the tanks. Valley Oil Company utilizes a patent-pending 7 stage filtration process that is superior to any process on the market today and has already attracted international attention. After the contaminants are removed, the filtration process polishes the fuel, removing any contaminated fuel molecules that are still attached to water and/or bacteria. Valley Oil Company’s filtration process filters and polishes the fuel to 5 microns, returning the good polished fuel to the tank, minimizing product loss during contaminant removal. 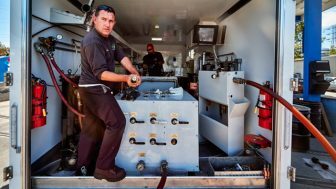 If the tank is directly plumbed to a generator, the generator does not have to be offline during this process. Contact us for a FREE DVD recording of the tank cleaning procedure, for more information, or to set up an appointment for a tank inspection or fuel polishing.